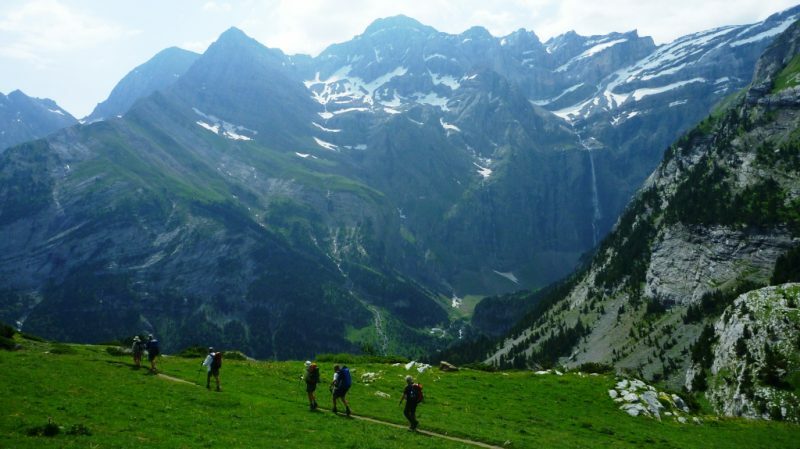 This trek takes you through the Gaube Valley, the Ordesa Canyon and the Gavarnie Cirque; the highlights of the central Pyrenees on both sides of the French-Spanish border. It takes in both the French Pyrenees and Spanish Ordesa National Parks (and of course the Mont Perdu World Heritage Area). Starting with the spectacular series of waterfalls above Cauterets you reach the north face of the Vignemale (the highest summit in the French Pyrenees) for your first night. We then cross into Spain, joining the long distance GR11 into Bujaruelo and Torla hiking through the beautiful forests of the Spanish Pyrenees. From Torla we climb up through the wonder of nature that is the Ordesa Canyon, then cross the border via the dramatic Breche de Roland, coming back into France and down to Gavarnie. For our last day we walk right around the famous Gavarnie Cirque on spectacular balcony paths. There is no better way to see these dramatic geological features and wonder at nature's force! 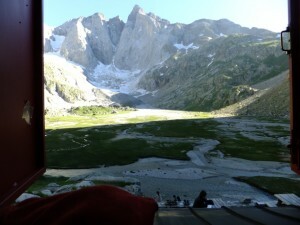 - If you do one trek in the Pyrenees - this is it! Price: 1010€ pp. Price includes seven nights half board accommodation in hostels and refuges with picnics each day, six days guided walking. If you are a group of four or more, discount of 50€pp. 575€pp for three days and four nights. Date: 18 - 25 Aug 2018. Contact and Book : Sian. Day One: Collection at Lourdes train station and transfer to Cauterets (1000m) for your first night in a comfortable refuge/gite (private rooms possible). We will answer last minute questions, check gear, show you where to buy last minute bits if needed and go through the route for the week. Day Two: On our first day we head straight out of Cauterets (1000m) and up towards the Pont d'Espagne (1500m) via the waterfall path. This is a great warm up day - a relatively gentle climb all the way and full of spectaclar nature! The waterfalls finishing with the most spectacular at the Pont d'Espange. Then the Lac de Gaube, and on to the Oulettes Refuge (2151m) for a wonderful view on to the north face of the Vignemale and its small glacier. +1150m altitude, approx 7h. Day Three: Today we cross from Oulettes Refuge (2151m) over into Spain via the Col des Mulets (2600m) - a steep climb and descent before a longer, gentler descent to the Bujaruelo Refuge (1350m). Spectacular high mountain scenery as we cross over, and then into the forest as we approach Bujaruelo. +450m, -1250m, approx 8h. Day Four: Today is an easier day, or can be if we choose. One route allows us to arrive earlier and spend the afternoon in the charming Spanish mountain village of Torla (1000m), and another longer walk is possible if the group would like a full day. In either case both paths are lovely and we enjoy discovering this part of Spain before our return to the high mountains. -300m, 10kms, approx 3h. Day Five: We have the option of the bus out of Torla (1000m) to reach the Ordesa carpark (1340m). The path is also pretty and adds about 1.5h to the day. From the Ordesa carpark we climb up the steep sides of the canyon to the spectacular Mirador de Calcilarruego. It is difficult to imagine a more spectacular view! We then continue along Faja de Pelay around the side of the canyon to reach the Goriz Refuge (2200m) at the foot of the Monte Perdido. From the village atmosphere of Torla we are now in high mountain territory with views of the canyon from above and mountaineers planning ascensions of the surrounding peaks. +1200m/+860m, approx 6-8h. 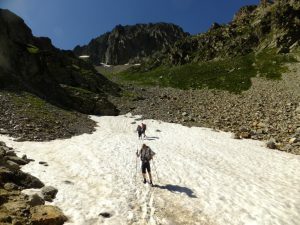 Day Six: From Goriz Refuge (2200m) we cross the Millaris Plateau and start our climb towards the famous Breche de Roland (2800m), our passage back into France. On the way we pass the entrance to a spectacular ice cave which we can have a peak into. Once through the Breche we have a relatively long descent to Gavarnie village (1365m) where we will be happy to find a hot shower and a good meal. +600m, -1435m, approx 8-9h. Day Seven: Our final day takes us up and around the Gavarnie Cirque, up to Espugettes Refuge if we choose, and down into the heart of the cirque via a balcony path. We have the option of climbing to the foot of the "Grand Cascade", the highest waterfall in France at 423m, for a high pressure shower! We transfer to Luz at the end of the day for a last night in a comfortable gite (dorm rooms) next to the fortified church in the centre of the village. Recover your extra bags and enjoy the atmosphere in this pretty mountain village. +700m, -700m, approx 6h. Day Eight: Leave Luz via bus (various times in the morning) to Lourdes (55 mins). We will help you organise your outward transport to suit your onward travel arrangements. 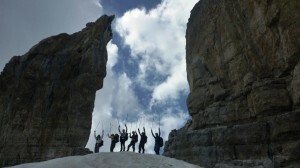 Note that the itinerary may be varied if weather or snow conditions compromise the safety of the group. To book you can use the on-line booking system below - select your start date and end date and then proceed. The system will ask for a deposit which you pay using PayPal. Or, if you prefer, you can email us directly (sian@pyrenees-mountains.com).